The problem is… they’re still sweats. And even though athleisure is apparently a thing now, for a long time those cute sweat pants still felt like, well, sweat pants. So I had to come up with a plan because as a mom, what I really need is comfortable clothes that make me feel put together. And here I am to share how I took joggers from comfy and frumpy to comfy and cute. Choose a closer fit. I tend towards sizing down one in joggers so they’re not baggy. Definitely try them on to see, but I’ve found I’d rather them a little closer to the bod than looser since they’ll stretch throughout the day anyway, and they will look more structured that way and less like baggy sweats. Add a completer piece. 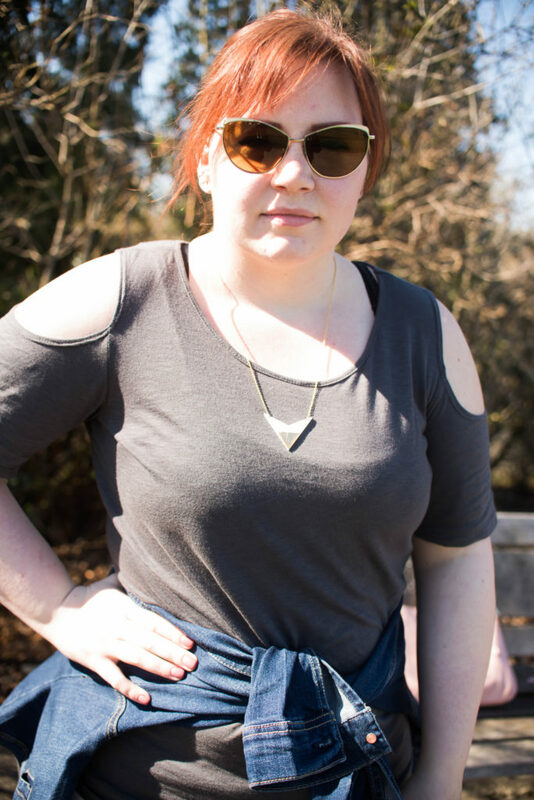 This is a good rule of thumb when dressing anyway to make a real outfit, but the denim jacket I added here acted as both a shield from early spring winds, and as a piece to elevate an otherwise comfy outfit. 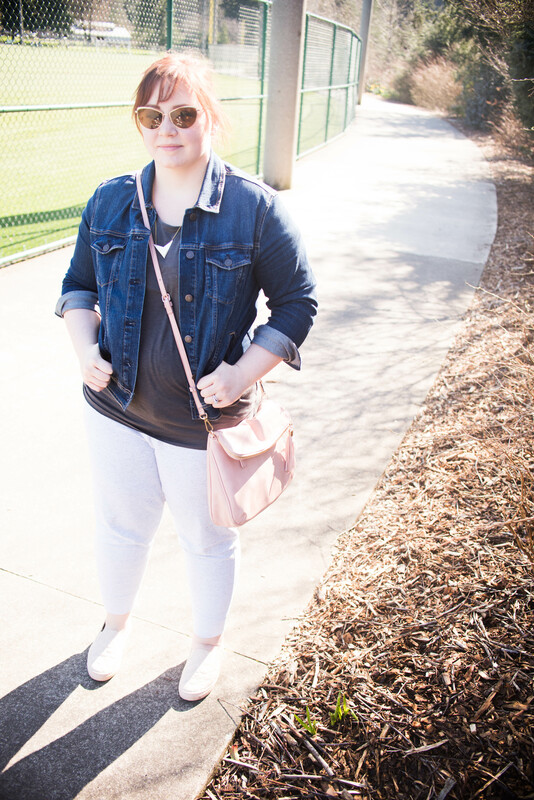 Don’t be fooled – the jacket is still super comfortable and I easily chase my kids in it, but it helps to keep it from feeling or looking like loungewear or pajamas. Also – I looove the look of a jacket around the waist. Even a chambray button down does a good job of defining the waist like a belt would, still gives that “completed” look but doesn’t look like you tried too hard. Accessorize wisely. 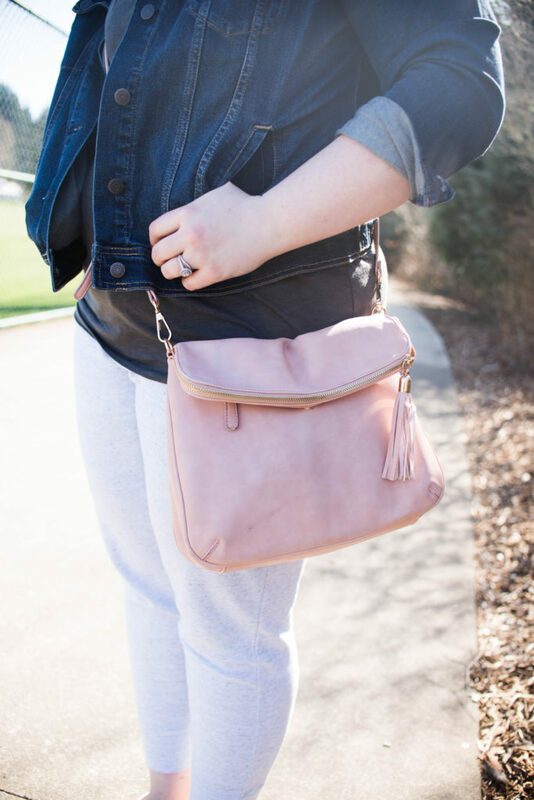 I love a pair of feminine sneakers, or a fun spring bag. Statement jewelry or fun sunnies – all things that make you feel more put together. Choose the cut for style, the fabric for comfort. Sure – this would be a simple tshirt and sweats outfit. And it is. But the cold-shoulder cut on the t-shirt gives it some interest, and I love the ankle length on these joggers. 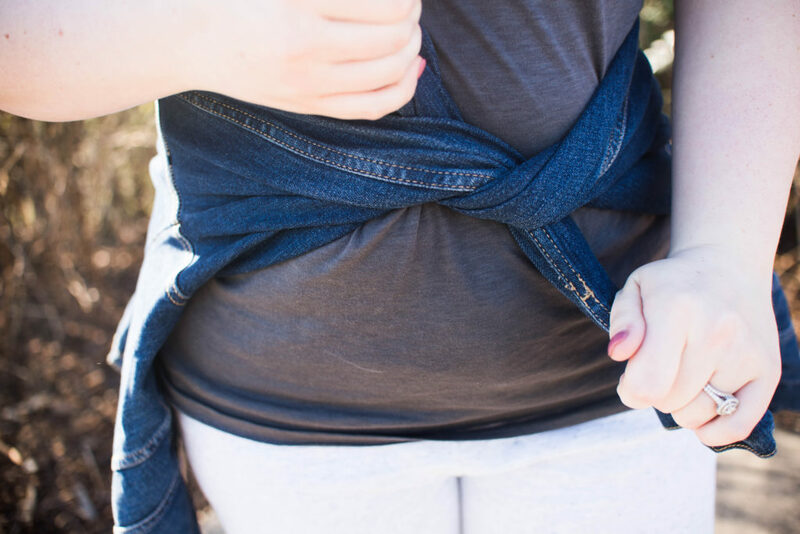 How things fit makes the biggest difference in how it looks and whether you look frumpy or put together. I look for trendy shapes in comfortable fabrics (usually knits because they’re soft and stretchy). Luckily, lots of retailers offer these so it’s not hard to find. Own it. Y’all – Lady Gaga showed up to an awards show wearing meat. MEAT. and she got away with it and is still crazy famous. If she can do that, then you can own a pair of cute/comfy sweats and rock it. The biggest tip I have for any outfit, any person, is just to own what you’re wearing. If it makes you feel good, then you look good. And that’s all that matters. 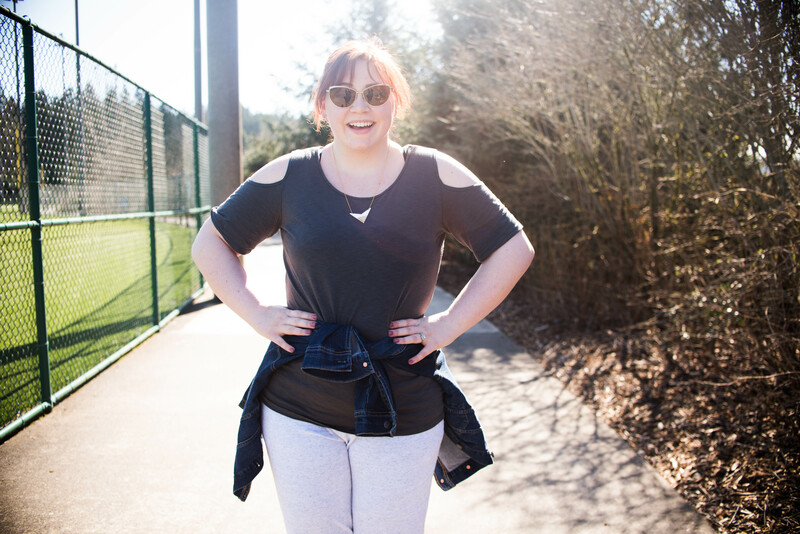 So what I want to know is – do you love joggers as much as I do? How do you dress them up so you’re comfy AND cute? I SUPER love joggers. I’m short so I try to make sure they’re not too baggy or I end up looking unbalanced. I love the tip to add a jacket and accessories to elevate a sweats look!